Lilting early digital Latin sounds from 1986, with randomised round-robins for accuracy • Cuicas, agogos, congas, timbales, claves, tambourine, COWBELL (yay!) • Sixteen sampled sounds ideal for adding some South American shimmy to your tracks • Bongos, whistles, high and low variants of most sounds… oh, and did we mention the COWBELL? What a fun little box this turned out to be. The Yamaha RX21L is, basically, the same sturdy plastic enclosure of the original Yamaha RX21 Rhythm Programmer (which I’m sure we’ll be getting to sometime soon…) only with its guts stuffed full of sixteen Latin percussion sounds instead of the original’s nine kit pieces. 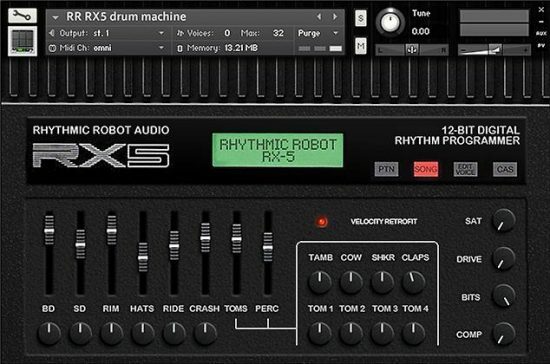 While Yamaha had to make some compromises to get all that sun-soaked goodness in – like doing away with half of the pattern memory – the result was a really neat collection of sounds, perfect for adding a light Latin groove to a track back in the days when getting more drum sounds usually meant buying a whole new drum machine. 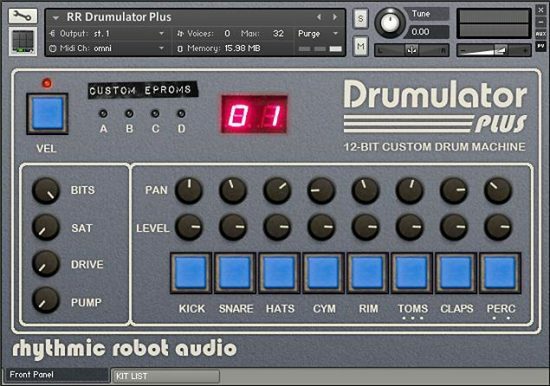 For us, it works best in conjunction with kick and snare sounds poached from elsewhere to give you an instant fusion of South American push-pull slinkiness with a firm bass foundation. Our version builds in plenty of velocity control so you can get some fingertip rolls and pitter-patters going and play up to the natural expressiveness of the sounds. And of course, because these date from 1986, there’s a crisp frosting of early-digital grain to every hit, making them much tastier than ordinary Cornflakes – um, Latin kit pieces. This is particularly nice on the agogos and timbales, which tinkle away beautifully. 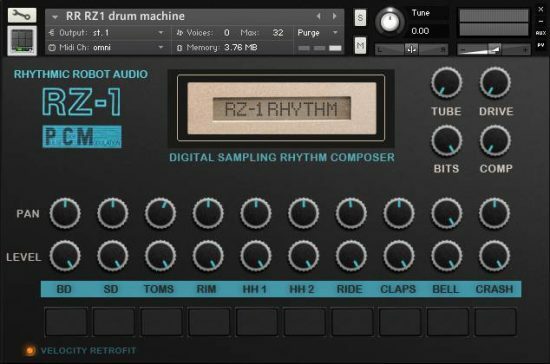 Of course we’ve also got some useful effects to bring even more versatility to the basic soundset: while Compression is probably not the one you’re going to reach for first (why compress sounds which are supposed to lilt? ), there’s a lot of fun to be had with a touch of distortion or some tasteful bit-crushing. We’ve also included a very useful Tilt EQ which makes smooth tonal adjustments a breeze. We’ll leave it up to your imagination where you want to take this stuff…! All the sounds include randomised round-robins of the samples for even more realism. Rather awesomely, those nice folks at Muzines have stuck an original review of the RX21L up on their site of digitised magazines from back in the day; so if you want to recreate the full experience of researching, buying and owning a RX21L – only, you know, like over the interwebs – why not take a quick look here? And finally, of course, cowbell. Need we say more? 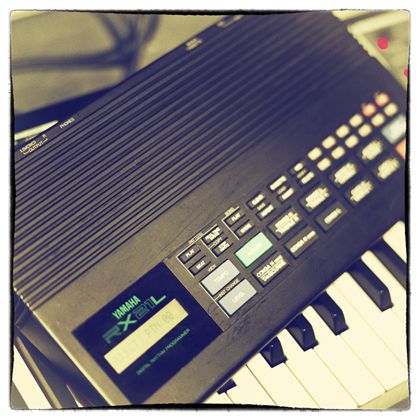 My very first drum machine was a Yamaha RX 11. I found every way of programming its limited sound set I could. 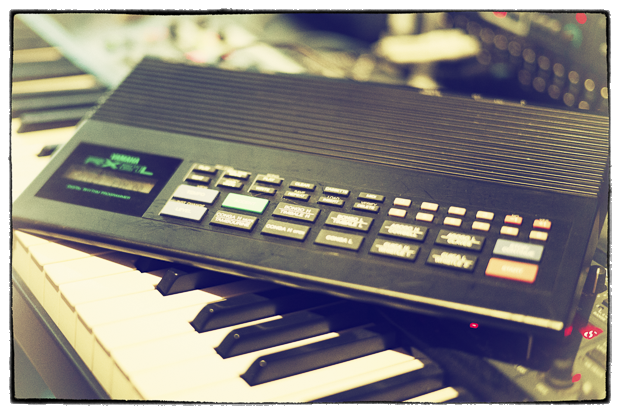 In those days, drum machines were expensive, relative to my salary, so having one at all was great. Not long after the RX 11 came out, the Latin percussion version, the RX 11L, was released, but I never had the money to buy one. Now, finally, I have closed the circle and completed the journey. 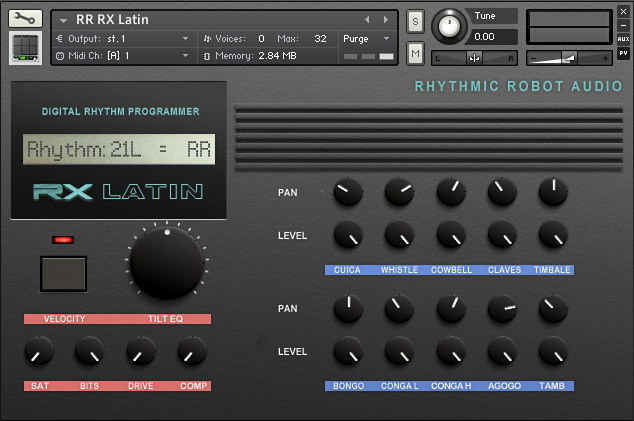 These sounds are all you need to pepper up your track with a little Latin spice and flavour. Loads of fun.